The first thing that I am really excited to tell you about is that I am teaming up with the Middle Grade at Heart Book Club to bring you great discussions and interviews with the authors of each month’s selection. So you can read along with us all and at the end of the month or sometimes early the following month, MG at Heart will host a Twitter chat to discuss the book together and I’ll host an episode of Books Between featuring that novel. After I list the reading schedule, then I’ll let you know where you can go to get more information about the MG at Heart Book Club. In January, we are reading Love, Sugar, Magic by debut author Anna Meriano. It is about an 11 year-old girl, named Leonora, in a tight-knit family where all the women are brujas – witches. Leonora soon discovers that she – like her sisters and mother – have magical abilities that manifest through their baking. I’m about halfway through this book right now and I love the family, and magic, and food, and culture. It’s like a mix of the movie Coco and one of my favorite novels, Chocolat. I just know you and your kids will love it! So, I hope you can join us all for the Twitter chat about Love, Sugar, Magic on Tuesday, February 6th at 8pm EST using the hashtag #mgbookclub. And February’s read is See You in the Cosmos by Jack Cheng! Oh my gosh – I just finished the audio version of this novel and I was blown away. Really – you HAVE to read this one! Or better yet since the premise of the entire book is that it’s recorded on an ipod – get the audio performance! You’ll just fall in love with Alex and his dog, Carl Sagan. So – stay tuned for the Twitter chat date for that book! In March, we’ll be reading The Vanderbeekers of 141st Street by Karina Yan Glaser. This one has been on my TBR pile for ages so I’m glad to have a reason to push it to the top of my pile and get ready for the sequel which, I think, is due out this fall. April’s book is Varian Johnson’s The Parker Inheritance – which sounds like a fabulous historical mystery. Can’t wait to read that one – it looks amazing! In May, we’ll be reading Every Shiny Thing by Cordelia Jensen and Laurie Morrison – a contemporary novel in half prose, half verse. June’s selection is The Mad Wolf’s Daughter by Diane Magras – a Scottish medieval adventure that sounds a bit like The Ranger’s Apprentice with a twist of Tamora Pierce. Doesn’t that sounds amazing? In July, we’ll be reading Just Under the Clouds by Melissa Sarno about a family struggling to find a lasting home. August’s pick is Cindy Baldwin’s Where the Watermelons Grow – a book about twelve-year-old Della Kelly of Maryville, North Carolina, who tries to come to terms with her mother’s mental illness while her father struggles to save the farm from a record-breaking drought. And November’s pick is The Hotel Between by Sean Easley -a story where twins Cam and Cass uncover the secrets of their missing father in a magical hotel whose doors lead its guests to places all over the world. And stay tuned for the December plans! So – I hope you are just excited as I am to read some outstanding new middle grade books this year. So – go get your pre-orders in, adjust those TBR piles, and I’ll see on Twitter and in your podcast feed. If you want to know more about the Middle Grade at Heart Book Club, check them out on Twitter at the handle @mgatheart. And you can find them online at mgbookvillage.org. And a big shout out to the creators of MG at Heart – Julie Artz, Cindy Baldwin, Laurie Morrison, Amanda Rawson Hill, and Kit Rosewater. 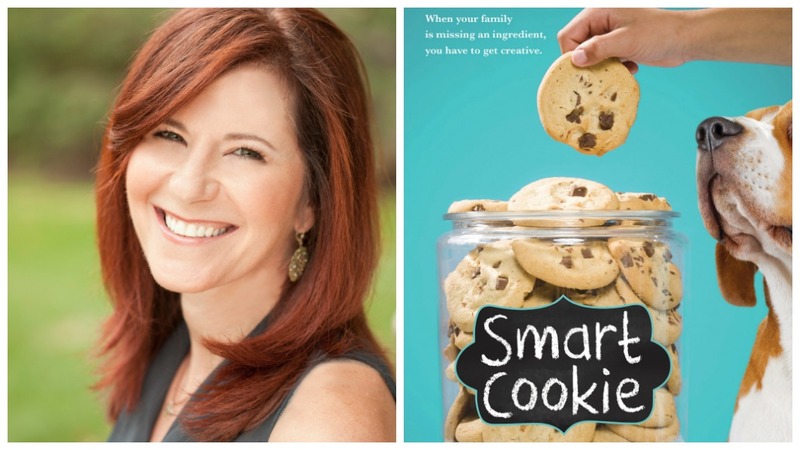 This week I am so excited to welcome Elly Swartz to the show – author of Finding Perfect and her upcoming middle grade novel, Smart Cookie. We chat about her new novel and the unconventional research she did to get the details right along with schools visits, her writing process, and what she’s been reading lately. Your new middle grade novel, Smart Cookie, is released in just a few days – can you tell us a bit about it? We all loved the Greene Family Bed & Breakfast – Angie wants to know – did you model it after a real place or a real situation? We all loved the game inspired rooms – Yahtzee and Monopoly and Checkers and Chess! My daughters and I had so much fun deciding which ones we’d want to stay in. So, we all want to know – which game-themed room would you prefer to stay in? And Lena wants to know – why did you decide to call the book Smart Cookie? I really loved the relationship between Frankie and her grandmother. I also grew up with an energetic, card-playing grandmother who lived with me, so I really connected with the bond between Frankie and her Gram…. Were you close to your grandparents? One of the parts of this book that had us laughing out loud (and cringing!) – were all the women that Frankie secretly sets her dad up with from the dating site! Did you do research on dating sites? I’ve been seeing a lot of pictures of your school visits lately! What are some of the things you like about visiting with students? I saw that you studied psychology and law – do you think anything from your time studying those subjects has helped you become a better writer or made its way into your novels? Was there someone like that in your life who impacted you as a reader? Before we wrap up, I wanted to share with you some news. As you may have heard, Matthew Winner and Blake Hamilton (co-founders of the All the Wonders website) have decided to end the project due to some other demands on their time and energy. However, all the podcasts happily – including Books Between – will still continue. Nick Patton’s Picturebooking podcast will be found on picturebooking.com. And the All the Wonders podcast will now be called The Children’s Book Podcast with Matthew Winner and will have a home at matthewcwinner.com. And for me, this episode will be the last one at www.AlltheWonders.com. All the previous episodes of Books Between and the transcripts will still be there. And, as always, you’ll still be able to find links to every single episode at booksbetween.com. On the next episode, I’ll have an announcement with some further details about our new home. For now, I just want to say how happy I am to have been part of the All the Wonders team. And how grateful I’ve felt for their warm welcome into that incredible family. I want to give a special thanks to Matthew Winner who within the first week of this podcast, has always been such an enthusiastic champion of the show and incredibly generous with his time, resources, and advice. And Matthew, and Blake, and everyone else at the All the Wonders team have made this show so much better than it would have been on its own. And as much as there is a twinge of disappointment at seeing the end of something so wonderful, instead of feeling like it’s a sad goodbye, I look at it like an evolution of how we all connect and collaborate. And I am really excited to see what Blake and Matthew have in store next! Because you all know that the forces behind the awesomeness that was All the Wonders are going to be up to something brilliant!